A fresh and pure layer of snow on the slopes is tempting on a beautiful winter's day. 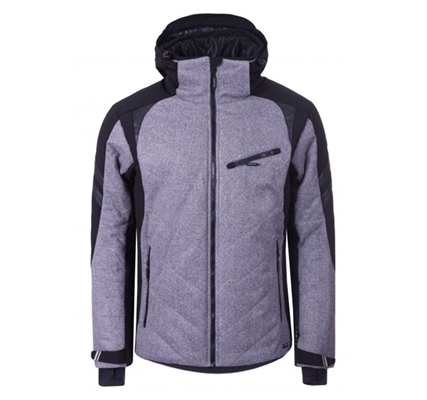 For these situations you need a jacket with excellent ski features and technical details. The waterproof material on this Luhta jacket blocks not only moisture but also the wind, as you race down the hill. The fixed snowgaiter is particularly practical when there is fresh powder. The front pockets with their warm lining, combined with numerous adjustment options allow for complete enjoyment! Material technology	This product is very breathable. The technical characteristics of the fabric provide superior thermo regulation and comfort. Waterproof and breathable fabric: 10 000 mm \ 5 000 mvp. The material protects you from wind and water in extreme conditions, and the breathability keeps you comfortable in light activities. This product made of a windproof fabric is designed for demanding use. It provides wind protection and warmth.